HONI is stout and powerful but still elegant looking mare. We had seen her at the track when she was in racing shape and fell in love with her strong, balanced conformation and cute face! She has a nice sized foot under her and short cannon bones. Her forearm and gaskin muscles spell POWER! She is by ON A HIGH SI 113 who won over 1.1 million racing and who’s progeny have won over $9 million racing! Honi’s Dam: TOROS HONI SI 88 is by EASY TORO (by EASY JET). EASY TORO is a full brother to the sire of STREAKIN SIX! Honi also carries the bloodlines of RAISE YOUR GLASS, DASH FOR CASH, and MITO PAINT. Honi herself was a money winner at the track and we are excited to see how she produces! 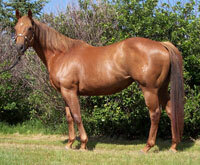 *ON A HIGH was the 12th ranked maternal grandsire of barrel horses in 2007. * Bred to AS GOOD AS NICK GETS for an ’09 foal.